The Art of War in Business Strategies - SunTsuArt.com. 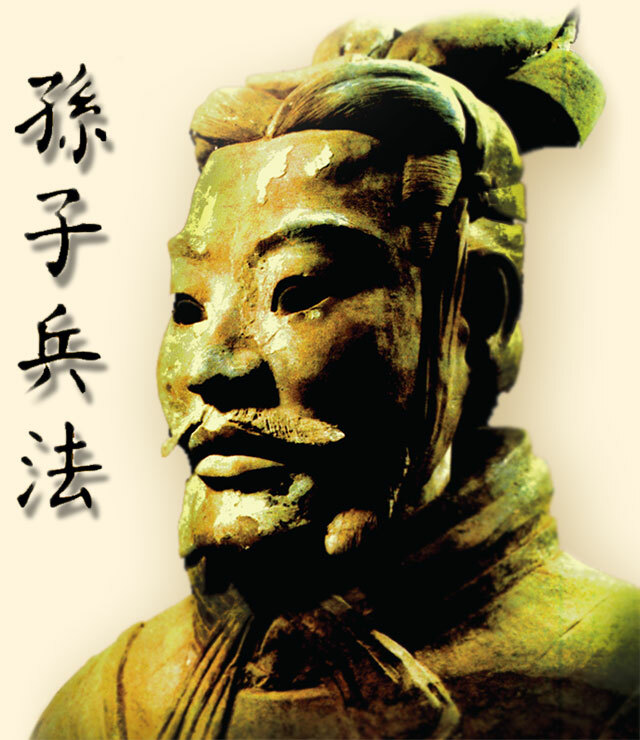 Sun Tzu invented the principle of Win-Win! The classic text of the Art of War has been a guiding manual for strategists in all fields of endeavor for almost 2,500 years. Are the principles of war really different from business? Planning, negotiation, outflanking, victory and restoration are key to both war and business. Employ ancient Chinese wisdom for business applications. Kill with a borrowed knife, that means borrow elements from the environment to open up more business opportunities. Loot a burning house - be able to identify business opportunities and grab it before others. Beauty trap - use aesthetics elements like product packaging to improve sales. Recruit the right person for the right job. Keep to your core business. Develop a complete business plan. Ancient Chinese wisdom gives great lessons on business management. The original Art of War is adaptable to make a business successful within and across industries today. The goal is not to replace the original Art of War as the source of strategic insight, but to make it a usable tool within the context of understanding how a business appears to be acting, by mapping the classic to the specifics of the contemporary economics. Any adaptation loses some of the power of the original, however this is justified in the cause of making the text fit the best. Master Sun Tzu would forgive such a liberal interpretation of his seminal work on the art of warfare. The key to strategy is the successful application of the yin and yang principle to achieve strategic advantage. Strong is matched with weak. Speed matched with slowness. Many matched with few. Far with near. Inexpensive with expensive. The best strategies are those that gain victory without fighting. The war should be won before it begins. The key to victory is to know your own capabilities and the enemy's. The Art of War is an effective guide to dealing with conflict in any field of endeavor. The Art of War has been successfully applied to non-military situations for thousands of years. The consummate commander is able to achieve and retain control of a military situation in a way that is analogous to an able ruler's control of the civil situation and a farmer's control over his crops; by a thorough understanding of the conditions determining the situation and the manipulation of these circumstances to his chosen end: He who knows the enemy and himself will never in a hundred battles be at risk. The emerging economic environment of business value networks requires new strategies to replace the old. The state of flux brought on by the "forces for change" in business environment means that the old strategies and conventional wisdom of the static market no longer apply. New strategies are required. The Art of War provides an inexhaustible source of such new strategies. The Art of War is a humanistic approach to conflict of any type. While the Art of War is a manual on how to effectively win a war, the text is above all else humanistic. It discourages "self seeking" military adventurism. It seeks to preserve a social order. Above all, it seeks to win without fighting. The Art of War is comprehensive. It addresses not only the military but the psychological and logistical aspects of conflict as well. In particular it stresses the role of the commander. Sun Tzu said: "If you know the enemy and know yourself, you need not fear the result of a hundred battles. If you know yourself but know not the enemy, for every victory gained you will also suffer a defeat. If you know not the enemy or yourself, you will succumb in every battle." In my business experience, conflicts usually occur when I am lacking information about a competitor or a colleague. But it can be even worse when I am oblivious to how my own behavior is being perceived. If you seek to understand both sides of every situation thoroughly, you can identify a solution where you get what you want and no one has to lose.